The recall of goalkeeper Lee Nicholls should not be seen as a slight on Stuart Moore, but instead a clear indication of who Paul Tisdale sees as his first choice. Nearly five weeks ago, Moore kept a clean sheet at Rodney Parade in his first league start for MK Dons since joining in the summer. Nicholls, having played 34 game prior, was out. A string of errors cost the 26-year-old his spot between the posts. Moore's clean sheet against Newport County began Dons' best run since 2015, putting together five wins in a row to climb back into the automatic promotion spots. 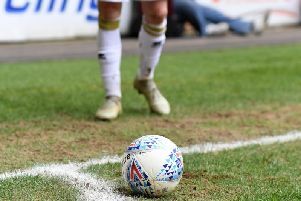 But after conceding four in Morecambe on Tuesday night as Dons lost their first game since he took over, Moore was back on the bench in favour of Nicholls for the visit of Stevenage on Saturday. Whether it was a lesson, or a punishment, or just making a point, it was learned, expunged or made. Chopping and changing of goalkeepers is not often something managers like to do, so Nicholls' recall says more about Tisdale's vision of his ideal team than it does about the performance of Moore in recent weeks. Nicholls mistakes cost goals, and just as outfield players are dropped after poor performances, Tisdale has shown his goalkeeper is no different. While dropping Nicholls for the trip to Newport was a statement, Moore could hardly be dropped as long as Dons kept winning. Nicholls remained the number one choice, but the manager could hardly justify another change. At the first opportunity though - Dons' 4-2 loss in a windswept Morecambe - Tisdale was able to bring Nicholls back into the fold. Moore had done nothing wrong, certainly no more wrong than Nicholls had to warrant being dropped himself. So Nicholls' inclusion in the 1-1 draw with Stevenage again on Saturday has shown who Tisdale's clear number one choice has always been. "Lee may feel he's a tad lucky to play after the way Stuart has played," said Tisdale after the game. He went on to praise Moore's performances in the six games prior, and the 24-year-old's attitude after being told he was returning to the bench. Tisdale said: "Stuart has proved himself. He's disappointed to come out. He has done extremely well but I took the decision to make a few changes. "We've got two keepers competing for the number one shirt which I don't think we had at the beginning of the season. Well done to Stuart, he's disappointed but he has dealt with it in the right manner – it's about the team getting over the line. He was well and truly behind Lee."